James Carter began thinking about and developing alternative theories of physics as a teenager. Around 1968, he developed the principle of Gravitational Expansion that explained gravity to be the opposite of Einstein’s General Relativity. In 1970 he presented this new theory in small book called “Gravity Does Not Exist”. During the 1970’s he continued to expand this non-field explanation of gravity in a couple more editions of this book called “Gravitation Does Not Exist”. During this same time, he developed the concept of the circlon as a non-field mechanical particle to explain both the photon and the physical structure of matter. This work culminated in the 1977 publication of “Periodic Table of the Circlon Elements”. This wall chart detailed circlon theory and had diagrams showing the placement of the protons and neutrons within the nuclear structure of each of the 104 elements known at the time. During the 1980’s, James continued to increase his understanding of his non-field mechanical theories of matter, space, time, energy and gravity and then began applying these ideas to the Big Bang theory and other ways in which the universe may have been created. It was around 1990 that he came up with the principle of Electron Transformation in which the mass of the electron gradually decreases over the course of cosmological time. Using this new principle, James was able replace the Big Bang theory with an evolutionary model of matter called the Living Universe. In 1993, he combined all of his theories into the book “The Other Theory of Physics” and a wall chart “The Creation of the Universe in Eight Days”. In addition to this, he printed up a revised full color version of “The Periodic Table of the Circlon Elements”.From then until the present time he has printed many new and revised versions of this book and recently a new book called “The Living Universe”. 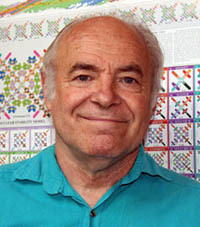 In 2001, Margaret Wertheim and Cameron Allen produced a documentary film called “Jim’s World” about his life and theories. In 2011, Margaret Wertheim wrote a book called “Physics on the Fringe” that is published by Walker & Company. This book features the life and theories of James Carter but is also a comprehensive history of the many alternative and underground scientific theories that have been developed parallel to but outside of the realm of mainstream science. Smoke ring sequence from the film “Its Jim’s World … We Just Live In It.” Photography and music by Cameron Allan.